221A is pleased to announce the appointments of Raven John and Sha Li as Public Art Assistants. These new full-time contract roles for the summer of 2018 will develop the next commission for Semi-Public, as it undergoes a transition towards a new project by Artist and Ethnobotanist T’uy’tanat Cease Wyss, who will initiate a rewilding process for the land at 271 Union Street. 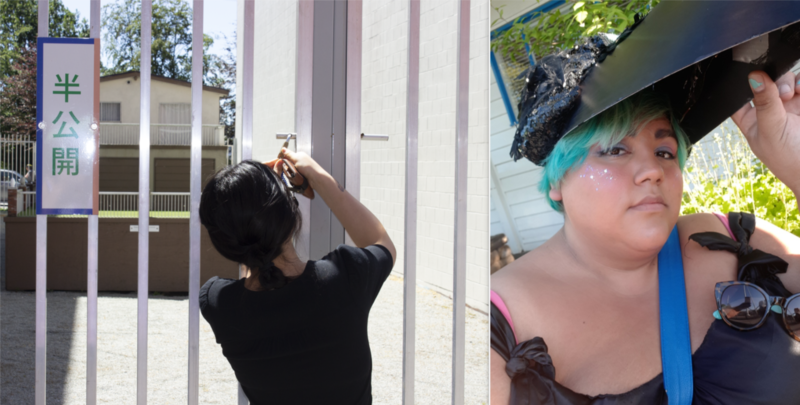 Sha and Raven bring their skills from socially engaged practices, commissioning, film production and project management to initiate 221A’s next public art commission. Please join us in welcoming Sha and Raven to the community when you visit next! Raven John is Indigenous, an Artist, an Activist, and Involuntary Comedian. As a Two Spirit Coast Salish/Stolo artist, she resides in the traditional, ancestral, unceded lands of the Musqueam, Squamish, and Tsleil-Waututh peoples, which have been forcibly occupied by the City of Vancouver. Raven’s practice is manifested through visual art, cultural consultation, and mediation. Raven graduated from Emily Carr University, with a BFA, Major in Visual Art, Minor in Social Practice and Community Engagement, and also completed the North West Coast Jewelry Arts program at the Native Education College. Sha Li is a Curator and Filmmaker, who holds a BFA in Film and Integrated Media at Emily Carr University and explored various artistic disciplines during art school, which include design, visual arts, classical music, and literature. She has worked in galleries and art institutions in Europe, Asia, and Vancouver, and she is the Director of the documentary short Being (2018), which profiles the Paris based Danish performance artist Sophie Dupont. In the Autumn of 2018, Sha will pursue an MA in Curating Contemporary Art at the Royal College of Art, London.